Does your 3rd grader know how to reduce fractions, plot points on a grid, or find the variable in a multiplication equation? 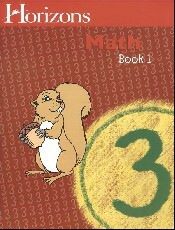 If not, the Horizons 3rd Grade Math Student Book 2 will teach him that and more! This best-selling student workbook contains colorful lessons 81-160 with 8 review tests. Pages perforated for easy removal. From Alpha Omega.